Chefs provide delicious, nourishing food to their guests, so it’s only fitting that chefs would join forces for an event that helps fight the nation’s childhood hunger epidemic. 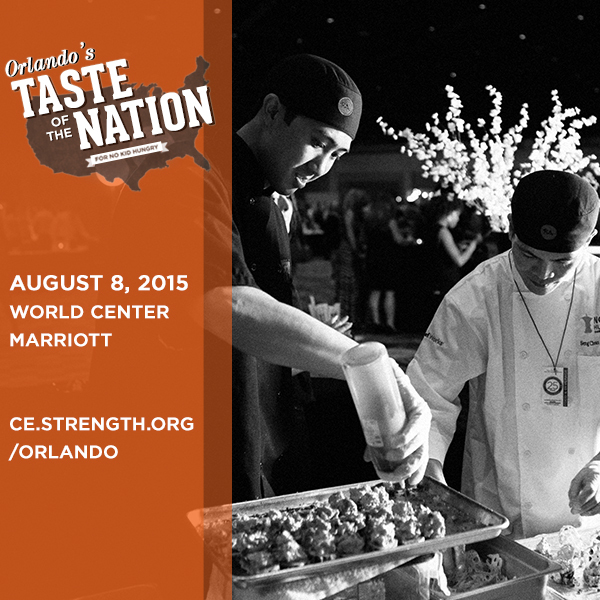 August 27, 2016 they will be out in force at Orlando’s Taste of the Nation® for No Kid Hungry. 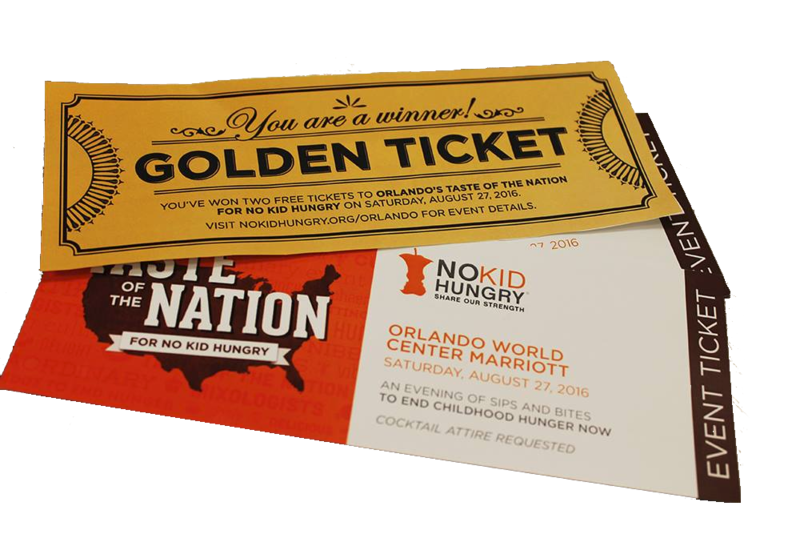 Leading up to the event, Orlando’s Taste of the Nation introduces the Golden Ticket Giveaway, offering an exciting new way to win a pair of complimentary tickets to this year’s event. Guests who dine at select, participating establishments can ask their server for a Golden Ticket to receive a concealed envelope that may contain a pair of tickets to this year’s event. Chances of winning are 1 in 10. Follow hashtags #OrlTaste and #GoldenTicket for a list of participating restaurants and updates on remaining Golden Tickets. The Golden Ticket Giveaway runs through Aug. 22. At Taste of the Nation, forty-two of Central Florida’s most distinguished chefs will showcase tasting portions of signature dishes, accompanied by fine wines, craft beers and specialty cocktails at the Orlando World Center Marriott to ensure children struggling with hunger in our city and across America are connected to the meals they need. Benihana, Canvas Lake Nona, Eleven and Forte at Reunion Resort, Hemisphere Restaurant at the Hyatt Regency Orlando International Airport, Nova Scratch Kitchen, The Osprey Tavern, Restaurant ASH, and The Rusty Spoon. Several popular brewers, wine purveyors and spirit vendors have also been tapped for this year’s event, including Brew Bus USA, Cigar City Brewing, Crooked Can Brewery, Orlando Brewery, Cooper’s Hawk Winery and Restaurant, Lakeridge Winery, Nestle Waters | S. Pell & Acqua Panna, Onli Beverage Co. In its 27th year, Orlando’s Taste of the Nation for No Kid Hungry is the region’s longest-running and most trend-forward food and beverage event raising funds and awareness for children’s nutrition programs provided by national beneficiary Share Our Strength, regional beneficiary Florida Impact, and local beneficiaries Coalition for the Homeless of Central Florida and Second Harvest Food Bank of Central Florida. In addition to appetizing food, fine wines, craft beers and premium spirits, guests also enjoy a fully automated mobile silent auction featuring signed memorabilia, stays at upscale hotels, dining experiences, rounds of golf on area courses, and exotic adventures and getaways. The Giving Tree raffle, sponsored by Edible Orlando, returns for the second year inviting guests to win a taste of Orlando’s most popular establishments. For a $50 donation, guests can select a Giving Tree envelope hanging from a towering tree containing a gift certificate ranging from $25 to $300 in value. The event’s ever-popular Instant Wine Cellar game offers participants a chance to win more than 150 bottles of wine valued at more than $2,500. There are only 250 chances to win this exquisite wine cellar. Each key is a $25 donation. Guests can also win fine bottles of wine with the all-new Ring Toss for Wine fundraiser. Rings are available for purchase to toss onto wine bottles ─ $5 for two tosses or $10 for six tosses. When a ring lands around a bottle neck, the guest wins a bottle of wine to take home. Orlando’s Taste of the Nation is presented nationally by Citi and Sysco and sponsored by OpenTable, San Pell/Acqua Panna and media sponsor Food Network. Special thanks to local sponsors Darden Restaurants, Regions Bank, Harris Rosen Foundation, Noble Marketing, Disney, FreshPoint, Hilton Grand Vacations, Bright House, Darden Federal Credit Union, Ernst & Young, Patriot National, Rosen Hotels & Resorts and Universal Orlando Resort. 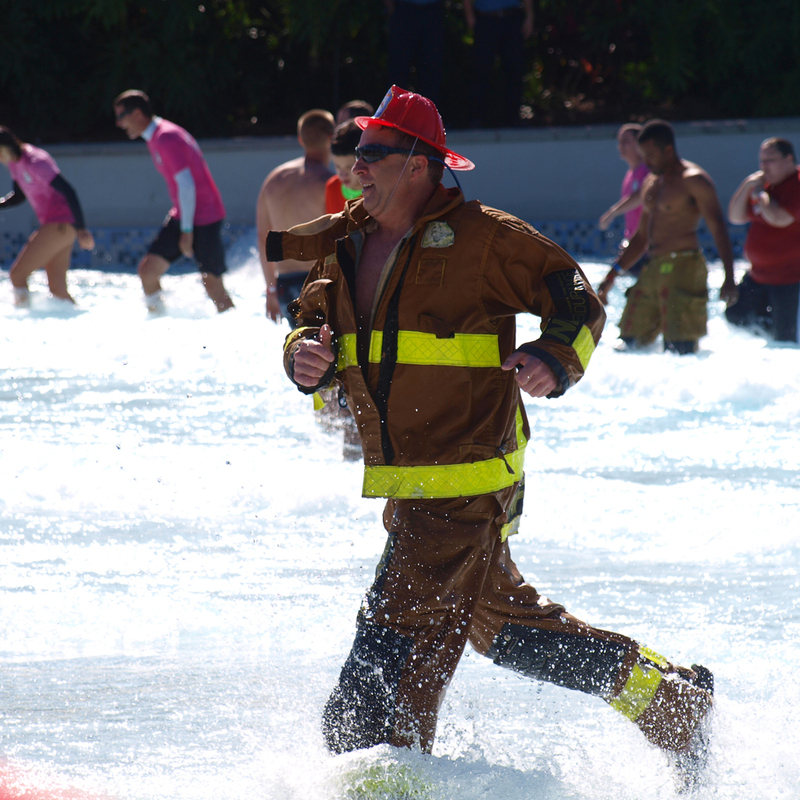 Saturday February 13, the Special Olympics Florida’s Polar Plunge® will be held at Aquatica. 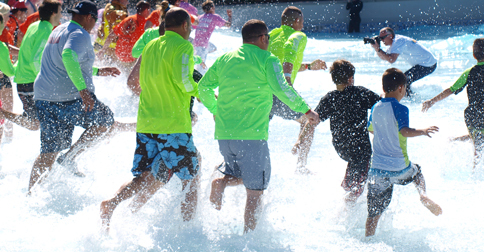 During this statewide fundraiser, individuals and teams, alongside Special Olympics athletes raise money for the privilege of Plunging into the chilled down wave pool. 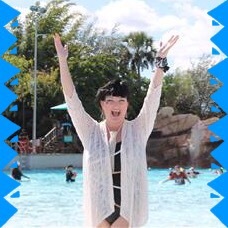 Aquatica is usually warm and tropical (as we all know! 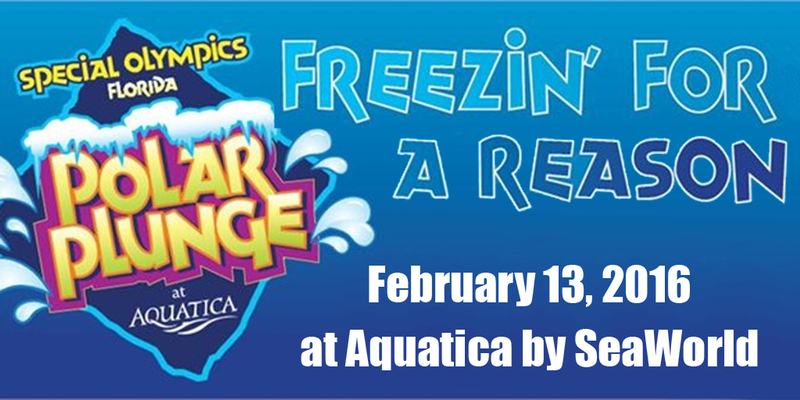 ), but once each year they chill down the wave pool so plungers can experience the “thrill of the chill” all while supporting a great cause. I remember my first Polar Plunge. 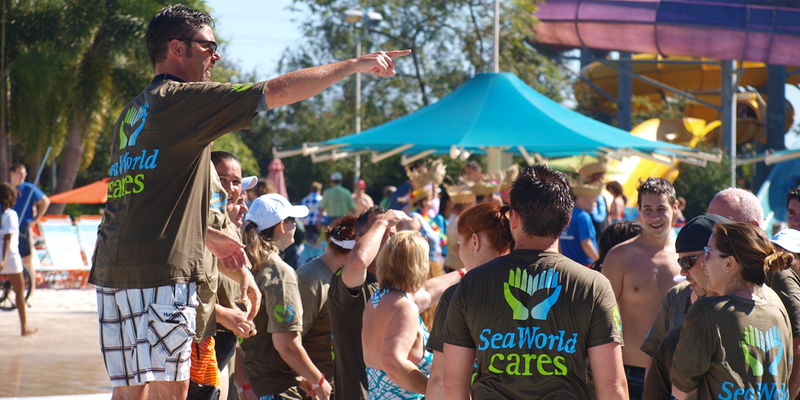 It was exciting to be part of such a huge joint adventure, with people from all over in crazy costumes, all “fired up” to get really “chilled down!” Each time it’s a heck of a lot of fun, but more importantly it’s an opportunity to make a difference. Every dollar raised helps the athletes of Special Olympics Florida by transforming their lives through the joy of sports. It’s loads of fun watching the firemen! The Florida Professional Firefighters are Presenting sponsors. There is no cost for plunging but Plungers are asked to fundraise a minimum of $100. Plungers create their own personal Plunge webpage so friends, family and co-workers can donate online. It’s quick, easy and secure. Spectators are welcome to join in, cheer on, and join the party. Only the wave pool will be chilled down, the rest of the rides are heated. Come for the Plunge, then enjoy Aquatica all day! If you don’t want to Plunge, but still participate, you can become a Virtual Plunger. Raise pledges and receive incentives just like a regular Plunger, but without going into the chilly water. 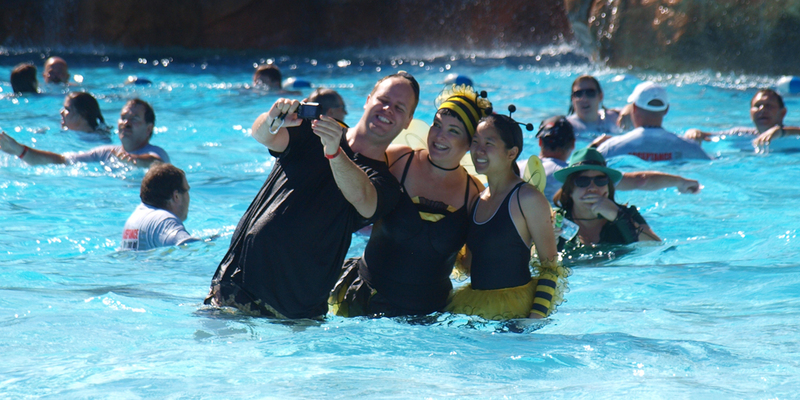 Plungers who raise the minimum of $100 in donations, automatically get entry into Aquatica, the official Polar Plunge® T-shirt, two spectator passes and bragging rights over everyone who just couldn’t bear it! Please join me in supporting Special Olympics Florida. 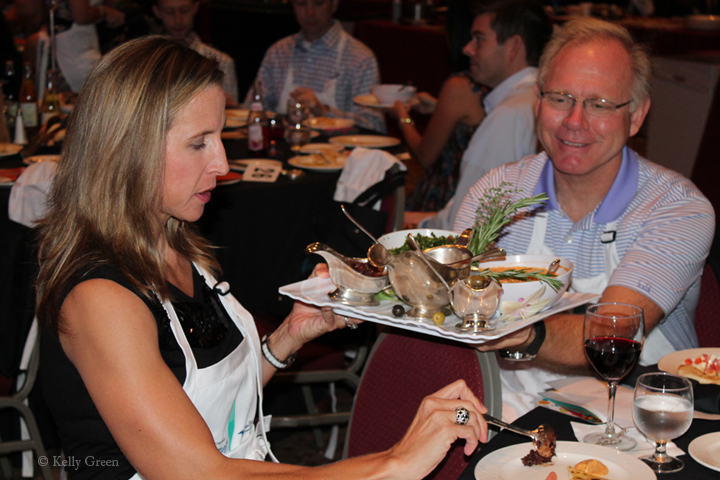 Forty-four of the area’s most accomplished chefs will showcase tasting portions of signature dishes, accompanied by fine wines, craft beers and specialty cocktails August 8, 2015 at the Orlando World Center Marriott, to ensure that no child grows up hungry in our city and across America. 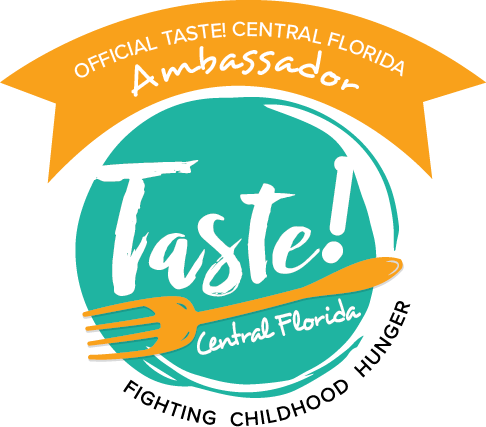 Proceeds from this event support children’s nutrition programs provided by local beneficiaries Coalition for the Homeless of Central Florida and Second Harvest Food Bank of Central Florida, regional beneficiary Florida Impact, and national beneficiary Share Our Strength. Every dollar raised fights hunger and homelessness in the Central Florida. Local beneficiaries include Coalition for the Homeless of Central Florida and Second Harvest Food Bank of Central Florida. Tickets can be purchased HERE. As an adult who was a hungry child in Orlando, I hope you’ll come out to support this event that helps so many. 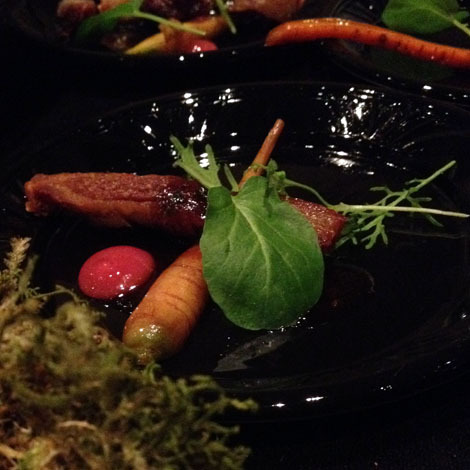 The Florida Hospital Foundation‘s Gourmet Soiree, Sunday, May 3, 2015, is one of Orlando’s top “foodie” events of the year. Featuring host Chef Robert Irvine (Restaurant Impossible) and local food celebs and co-chairpersons Emily Ellyn (Next Food Network Star contestant and recent winner of Cutthroat Kitchen) and Kendra Lott (editor, Edible Orlando), Gourmet Soiree is not your average fundraising gala. While some events are tuxes and gowns with food brought TO you, at Gourmet Soiree the guests actively participate in their table’s creations. 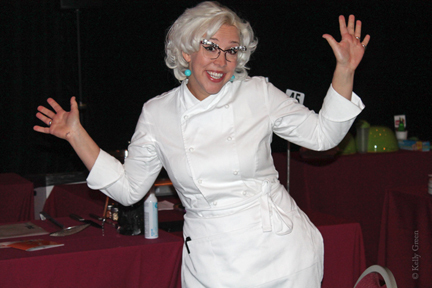 Retro Rad Chef Emily Ellyn (from the Next Food Network Star and Cutthroat Kitchen winner) is co-chair of Gourmet Soiree 2015. 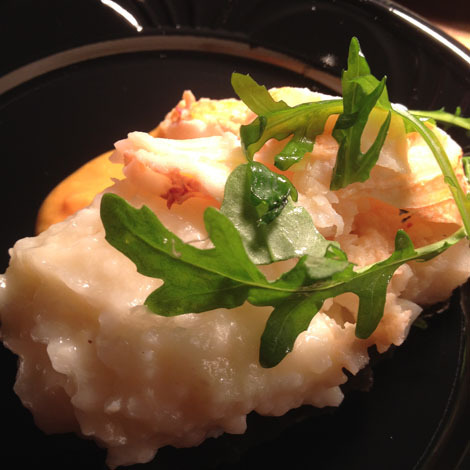 Last year I went to my first Gourmet Soiree at Rosen Shingle Creek. The magnificent ballroom was beautiful, adorned not in flowers and fluff, but food, glorious FOOD! Whole Foods Market, one of the event’s biggest sponsors, provided mountains of vibrant vegetables and scores of spices among other delicious options for the chefs and their tables. From those delicious pantries guests gathered their grocery listed items to create wonderful, healthy, delicious meals. Who would win the Silver Fork? We were most interested in creating our own award-winning meal as judged by those who designed our table’s menu: Us. In addition to the fun of working with a top local chef and learning tips and techniques, there was a huge silent auction with offerings from exotic trips to luxury merchandise. In the midst of all of that, was the ever-inspiring Robert Irvine whose hosting got the whole room pumped up and excited about Florida Hospital for Mission fit Possible that goes into schools to teach them about healthy eating and healthy living. This year’s Gourmet Soiree promises to be even more exciting, with chefs from all over Central Florida from the top restaurants including Kevin Fonzo of K Restaurant Wine Bar, John Rivers of 4 Rivers Smokehouse, Trina Gregory-Propst with Se7enbites, and Andres Mendoza with Norman’s to name but a very few. The auction lineup is equally impressive: LeVian Chocolate Diamonds, a SeaWorld dream package for 6 (which I would LOVE to win, LOL), tickets from Orlando Philharmonic Orchestra, cupcakes for a year from Gigi’s Cupcakes Orlando, and an entire bookshelf of cookbooks, most signed by the authors. There are golf packages, amazing trips, and a personal favorite: stuffed animals and books from RugbyAndReme.com. It’s not too late to support the work of Florida Hospital’s Mission fit to fight childhood obesity, and all their programs by participating in Gourmet Soiree. Visit their website to see how you can help, get involved, or buy a ticket so you can sit at the table next to mine as I help cook up something great that just “might” win the chef from our table that Silver Fork…. 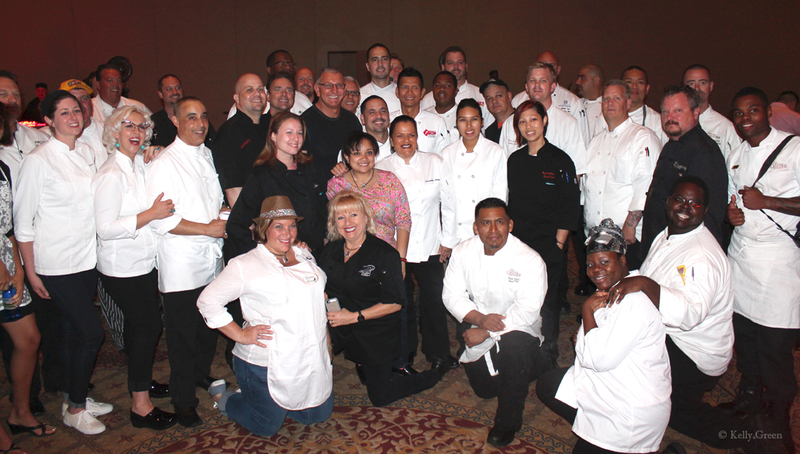 Chef Robert Irvine with the many talented chefs who made Gourmet Soiree 2014 at Rosen Shingle Creek a tremendous success. 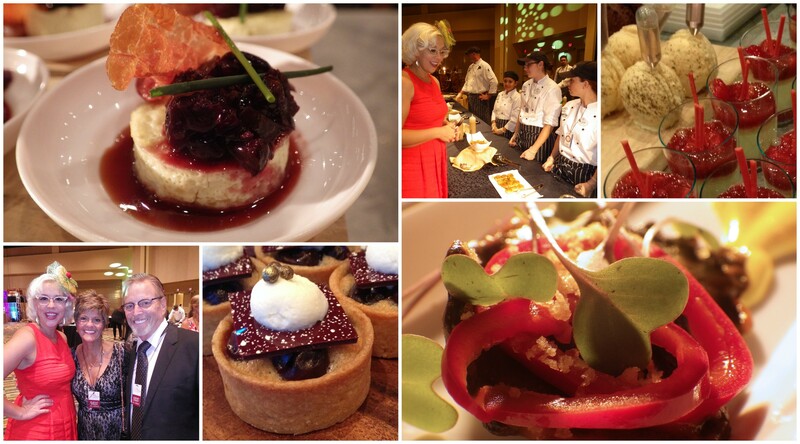 August 9, 2013, The Orlando World Center Marriott welcomed Share Our Strength’s Taste of the Nation®. Featuring the area’s finest appetizers, entrees, desserts and spirits, Taste of the Nation 2014 set a new fundraising record of $301,317 to support the feeding programs of Coalition for the Homeless of Central Florida, Second Harvest Food Bank of C entral Florida and an organization dedicated to reducing hunger and poverty in Florida statewide: Florida Impact. 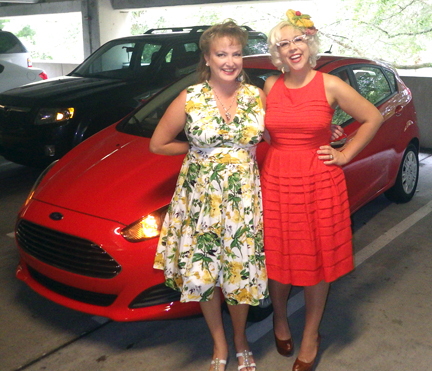 Retro rad celebrity chef Emily Ellyn and I arrived at the event in race-red style, as part of a cross-blog Southeast Ford promotion where I got to test drive a brand new Ford Fiesta for a week for Central Florida Top 5. The plan was to take ‘er for a spin to those events that are Top 5 on our family’s list: Travel, education, charity, culture, food. Happily for me, most of our stops involved a combination of two or more of those each time. Taste of the Nation Orlando, was no exception. In addition to sampling some of the most delicious bites from chefs around Central Florida, guests enjoyed participating in raffles and drawings of epic proportion (like a trip to Oktoberfest in Germany and over a hundred bottles of wine!). The highlight of the night: two chefs (Kevin Fonzo of K Restaurant and Alexia Gawlak of Siro: Urban Italian Kitchen) went head-to-head in a live cook-off. Emceed by Food Network celebrity chef Melissa d’Arabian, the contest allowed 20 minutes for each chef to create a dish using Creekstone Farms sirloin flap steak and pantry staples donated by Whole Foods Market. Though I would have enjoyed tasting both dishes, I didn’t envy judges Scott Joseph from Scott Joseph’s Orlando Restaurant Guide, WFTV’s Bob Opsahl, and Honorary Chair Helen Donegan. While both dishes were prepared expertly (and smelled heavenly! ), Chef Gawlak was declared the winner. 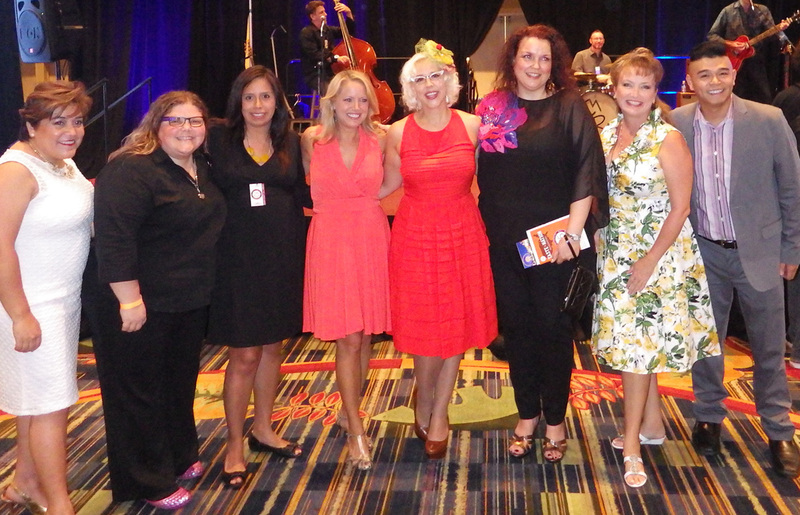 Area restaurant bloggers and pro foodies flank coral-colored Food Network divas Melissa d’Arabian and Emily Ellyn. Share Our Strength’s Taste of the Nation Orlando event brings together the area’s top chefs who donate their time, talent and passion to end childhood hunger in Central Florida. Along with culinary delights, guests have the opportunity to sample select wines, cocktails and premium beers and enjoy silent and live auctions and entertainment. Every dollar raised fights hunger and homelessness in the Central Florida. Local beneficiaries include Coalition for the Homeless of Central Florida and Second Harvest Food Bank of Central Florida. 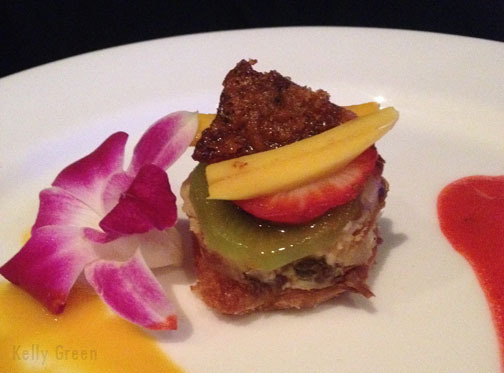 Visit Orlando’s Magical Dining starts tonight, August 25! Starting tonight and continuing all September long, Orlando foodies can celebrate the area’s amazing culinary scene during Visit Orlando’s Magical Dining month. Over 75 restaurants are participating in the prix fixe dinner offerings that include appetizer, entrée and dessert for $33 (read the full lineup here). From sumptuous seafood, to savory steaks (and everything in between), Magical Dining is the ultimate way to try all the restaurant’s finest offerings for a fraction of their usual price. To top it off, diners are supporting not only our incredible food community, but donating to charity at the same time. One dollar from each meal will be donated to the Foundation for Foster Children. Hyatt Regency Orlando — $169 per night plus tax. One night in a standard room and Magical Dining dinner for two at Napa Steakhouse. World Center Marriott — one night in a King or Double Room and Magical Dining dinner for two at Siro: Urban Italian Kitchen from $219 per night. With all these choices, I know I’m hard-pressed to pick a favorite. Last year I tried A Land Remembered and Fogo de Chao. At the blogger preview this year I sampled Siro: Urban Italian Kitchen and tonight at the special behind-the-scenes Yelp Kick Off I’m excited to taste menus from Hemingway’s, Fiorenzo Italian Steakhouse, Napa, K Restaurant, Ruth’s Chris Steakhouse, Siro Urban Italian Kitchen, and Cuba Libre Restaurant and Rum Bar. 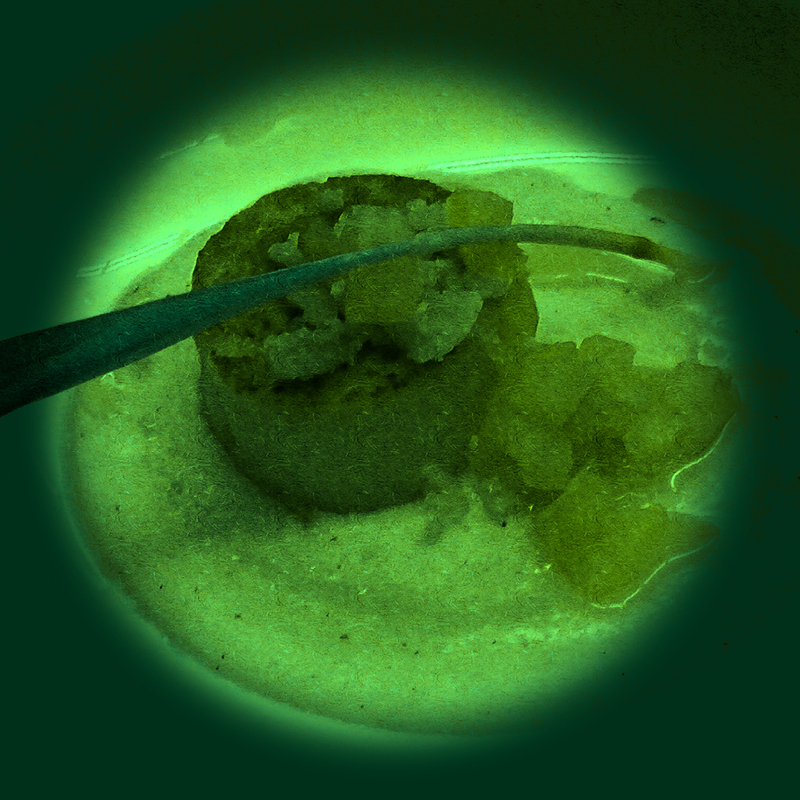 Follow #MagicalDining on social media to “virtually” enjoy every bite. Make your reservations to enjoy in person. Mangia, mangia! What are your favorites? Any menus that blow you away? A favorite childhood memory is the treat of having a PBJ and a tall glass of milk. When I visited my grandparents that delicious combo was often accompanied by a couple cream-filled chocolate cookies and an orange (we’re Florida natives, so we had oranges with just about everything!). As grocers, my grandparents never lacked in fresh healthy foods when I visited, or eventually came to live with them. That wasn’t the case when I lived in Orlando with my mom. 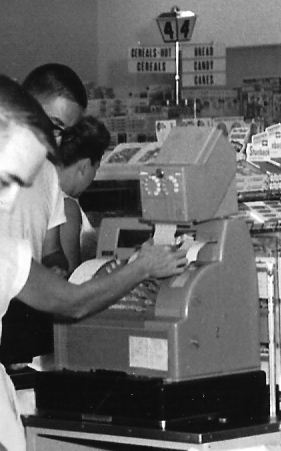 1950s, opening day at my grandparents’ grocery store in Florida. After my father died, my mother had a hard time getting back on her feet. My half brother and I spent many a day riding our bikes on the roads around Colonial Avenue while my mom tried to work things out. We climbed the tree on the empty lot down the street with the neighborhood children, and the “big kids” often ran ahead on the bumpy brick-paved roads while the scrawny toothpick-legged ones like me did our best to catch up! We knew we went hungry sometimes, but like most kids in that situation we weren’t convinced we were poor. It was “just the way it was”, though if a friend offered a snack or a meal while visiting their house… well, you didn’t have to ask us twice! Today there is a new generation of children in Orlando and throughout Florida who don’t have the “luxury” of fixing up a quick sandwich whenever they please. Perhaps they’re like we were who often settled for a “jam sandwich” (where you take two pieces of bread and “jam them” together) and no milk most days, but water. We were not alone. Today, 1 in 5 Central Floridians are struggling with hunger each day. Second Harvest Food Bank is one of the stop-gaps for families like mine. Through their distribution of food in to more than 500 nonprofit partner agencies in six Central Florida counties, people who want just a little help to get by are given the food they need for themselves and their children. This year, FlBlogCon has partnered with the Florida Dairy Farmers to spread word about the Great American Milk Drive, to help raise awareness and funds for the single most requested food staple: milk. Click on the picture to hear how Jesse Tyler Ferguson is helping spread the word about the Great American Milk Drive and how donations are shared in your community. Our family has already made a donation so other families and individuals who request milk can receive it. Here’s my challenge: If you have no problem purchasing a gallon of milk or more each week, I hope you’ll consider “virtually” picking up a couple extra for your neighbors. It “does a body good” to drink it, and it does a heart good, too, to share a tall glass with others, if only online. No way to give? No problem. Blog, share, or post to Twitter, Instagram, Pinterest (or wherever!) using the hashtags #FLblogging4good and #floridamilk to spread the word with your friends and family. Who knows… some FaceBook friend might not be posting on their wall that they could use help from Second Harvest and the Great American Milk Drive. 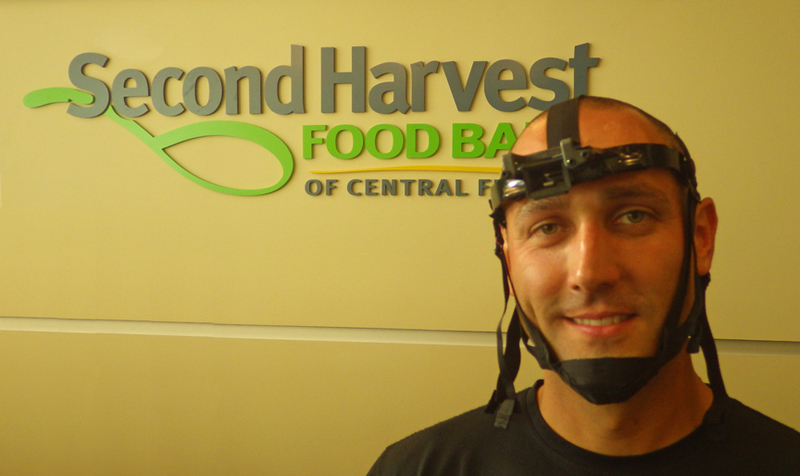 Thanks Second Harvest for letting me originally share this as a guest post (here).